Routing in Work Order allows you to automate your work flow process for new requests. It tells the system when and where to send work orders. Work orders can be automatically routed based on the work order Location, Bldg./Unit, Craft, Purpose, or any combination of the four. Two of the most commonly used routing patterns are location based and craft based. Location based approval routing automatically routes a work order based on its assigned location. Most commonly, it may go to a Manager (department head, site manager, etc.) for approval and then, once approved, sent to the maintenance department. 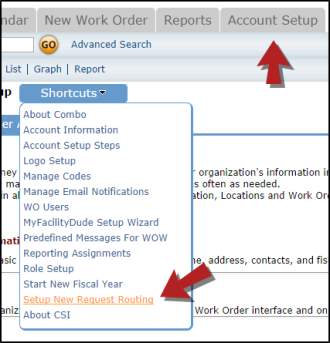 Click on Setup WO Status Routes, or hover your mouse over the Shortcuts menu and click Setup New Request Routing. Under the Add New section, choose the name of the location in the Location drop down box. Under When Approved By - Route/Assign To Next, leave the top drop down box as "No One". In the bottom box, choose the name of the person responsible for the approval of the work order for this location. Click the Add New button to save. This route now moves up to the list of routes at the top of the page. *Note: In the example pictured below, this route instructs the system: Anytime a new work order is submitted for Dude Hospital, send the work order directly to Jane Doe for approval. Go back to the empty route in the Add New section and select the location again in the Location drop down box. Under When Approved By - Route/Assign To Next, select the name of the first person in the approval process in the top box. In the bottom box, choose the name of the person whom the work order should be sent to after the first approval. If this is the final route and the work will be performed by the user listed in the Assign To Next field, check the box to Stop Routing. Click the Add New button to save. *Note: In the example pictured below, this route instructs the system: Once a work order for Dude Hospital has been approved by Jane Doe, send it to John Doe. Click on Setup New Request Routing. Under the Add New section, choose the craft from the Craft drop down box. Under When Approved By - Route/Assign To Next, leave the top drop down box as "No One". In the bottom box, choose the name of the user responsible for the selected craft. Click the Add New button to save. *Note: In the example pictured below, this route instructs the system: Anytime a work order is submitted for the craft of Custodial, assign the work order directly to Tom Jones.